I got spanked with this. 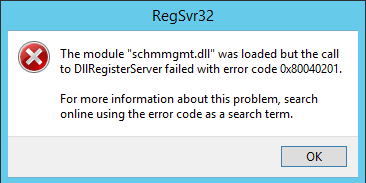 The module “schmmgmt.dll” was loaded but the call to DllRegisterServer failed with error code 0x80040201. User Account Control (UAC) doesn’t let us do this directly from a run dialog. To do this and get it to work, you need to run this from an administrative command prompt. and more to the point, lets you run the Active Directory Schema Management console.